A foodie exploration of Ireland is an island-wide adventure involving the favorite Irish pastimes of eating, drinking and socializing – from cafés and pubs, to stylish Michelin-starred restaurants. In the 'Emerald Isle', food is intimately connected to the rich green landscape, regional farming and cooking traditions, the freshest seasonal ingredients and supremely talented food-meisters who magically inject ‘art’ into artisan Irish produce and modern interpretations of Ireland's culinary heritage. Not to mention Ireland's famously colorful turns of phrase. On the one day a year that 'everyone's a little bit Irish', up the ante on your green beer. Here's a guide to ordering authentic flavors of Ireland. And some tips about where and what to eat and how to celebrate Ireland's food culture on your next trip. Climb on board O’Holohan’s, moored at the Belfast Waterfront. This restaurant-on-a-barge is famed for its boxty: a traditional potato pancake, which it serves with pan-fried hake, organic veg and shellfish cream. Bring on one of the best fish dishes in Dublin. This is a thing of brains and beauty: lapsang souchong home-smoked salmon, served in the incredible surroundings of a converted Victorian building on Dublin’s Camden Street. 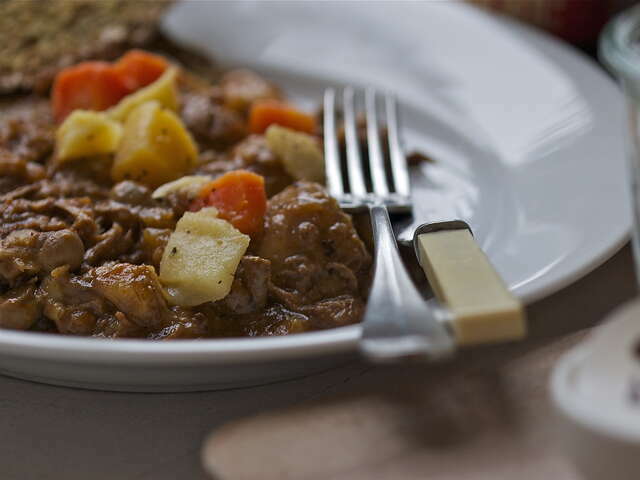 It’s the very essence of contemporary Irish cooking – creative, fresh AND delicious. Overlooking the iconic arc of the Ha’penny Bridge, the Woollen Mills has a light, modern-industrial interior – a great counterpoint to a dish that dates back to the 1770s, Dublin coddle, a no-nonsense bowl of bacon, sausages, onion and potato. Honest, hearty and very Dublin. In the super-cool open-brick surrounds of Belfast’s premier arts venue, MAC, you can enjoy one of Ireland’s most popular seafood dishes: seafood chowder. MAC’s version uses sustainable fish, and comes with Guinness and treacle bread. Come for the art, stay for the chowder. Fever-ridden Molly Malone wheeled her wheelbarrow around the Dublin streets selling these fresh local molluscs. But to dine on the cooked combination, you need to check out the Exchequer gastro pub and its gourmet version with spiced sausage, Bulmers cider and homemade bread. Traditionally served with pints of Guinness, sample some of the finest at the Mourne Seafood Bar in Belfast. In this relaxed informal space, seafood takes centre stage. Try local oysters three ways: au naturel, Japanese-style or Rockefeller. Either way, they’re delicious, so get shucking. September is the month of the oyster and in Northern Ireland the annual Hillsborough Oyster Festival (1-4) holds the world oyster eating championships – you’ll have to eat around 223 in three minutes if you want to seriously compete! But the pretty Georgian village is alive with music, Ulster’s fine food, golf, dancing and pageants if you don’t. The world-famous Galway International Oyster and Seafood Festival (23-25) is also a major event in Ireland´s social calendar – London’s Sunday Times has called it one of the 12 greatest shows on earth. Walk through the city and you’ll see passionately fought-out Irish and international oyster opening competitions, celebrity cook-offs, and fantastic live music events on the streets and pouring out of the pubs. Few can resist a Galway oyster tasting (with the perfect accompaniment of a pint of Guinness), a ‘seafood dine-around’ some of the city’s best restaurants or a glam night out at the Gala Oyster Ball. A philosophy of simple but impeccable fish and chips runs through this Belfast institution, which has been described by the Belfast Telegraph as “the holiest of holy culinary shrines”. Grab a space at a Formica table, order a cup of tea, and wait for some of the best fish and chips you’re ever likely to taste. Waterford locals love their ’blaa’ – a soft bread roll introduced by the French Huguenots in the 17th century. Paired with dry-cured bacon, it’s a real delight. 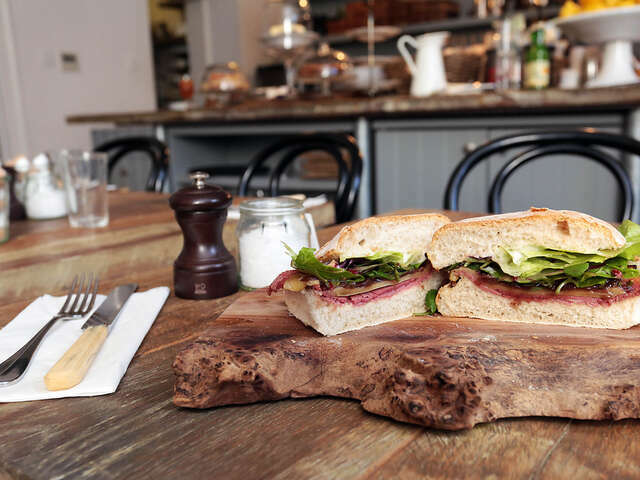 To try one in Dublin, head to the Georgian kitchen-café of Hatch & Sons on St Stephen’s Green. Go old school with rashers (strips of bacon), or take it upscale with spiced beef, rapeseed mayo, Coolea cheese and onion relish. Visit September's Waterford Harvest Festival. The city's famous fluffy breadroll blaa is centerstage, along with other local delicacies. Over 10 mouth-watering days, foodies will relish the cookery demos and workshops, seminars, foodie films and tastings, dinners, banquets and restaurant trails. Street performances and big outdoor music gigs are also on the Waterford menu. If you want to take your love for food a bit deeper you can sign yourself, your family, your colleagues or your pals up for one of the excellent cookery schools located around the country. 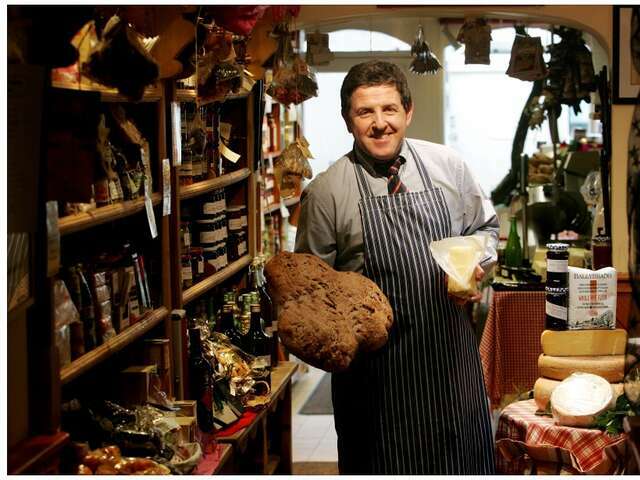 Serious foodies can also opt for a food tour – counties Cork, Mayo and Dublin are excellent for these.